Feedback on my first two pages? I also really like the moth. It's adorable. I'd like to read more for sure. This looks really cute! I'm interested in reading more! Overall, it looks really good! Only a few minor things I notice... the text might be a bit small, especially for mobile readers. "Oh the hydrangeas" is a bit difficult to read even on my large monitor. For the paneling, it also looks good overall. It's simple which I always feel is best, but the grid itself needs a bit of work. The edges aren't lining up exactly, they're all a bit off which makes it look more like a mistake than intentional, especially with the 3 middle panels on the second page. On the second to last panel of the second page, it looks like the perspective of the background might be a bit too high up. That moth is really great. @Cavechan thanks so much for the critique. I wondered about the text as well. I made a font with my own handwriting but I was thinking it's hard to read as well. I did intentionally make kind of loose panels to see how I liked it but I agree with you that it turned out a bit sloppy instead. Definitely right on about the perspective in that lower panel as well. Thank you for your feedback! Eventually I'll post more- when I get a good buffer up! 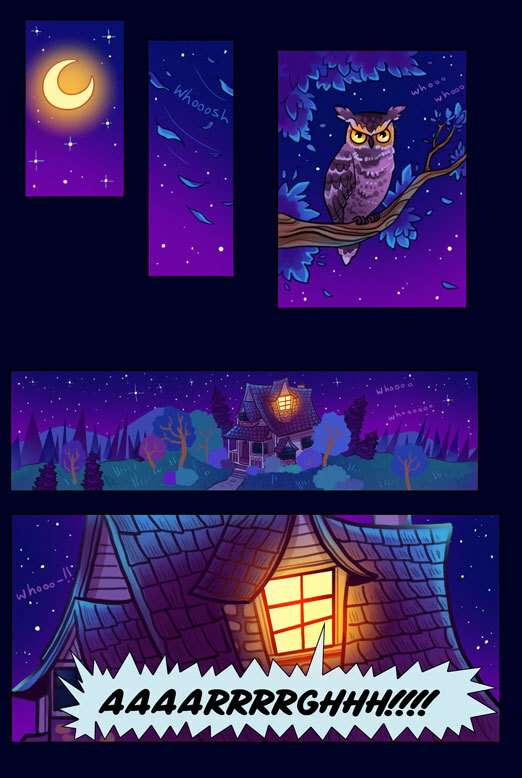 I like the starry skies, owl, house and the color gamma of the first page as a whole. This page is beautiful. Second one is good, too, but colors changed too abruptly, and gradients almost disappeared, which confused me a bit. Should this show some contrast from outside the house and from the inside? Also I really like talking night-fly so far. He (she) is very cute, and in the same time not humanized and look really like a night-fly. I didn't see such a familiars before. Thanks for your feedback! I am trying to shift to a different mood and color scheme- from outside to inside the room- do you have any ideas how I could improve the transition? And thanks! 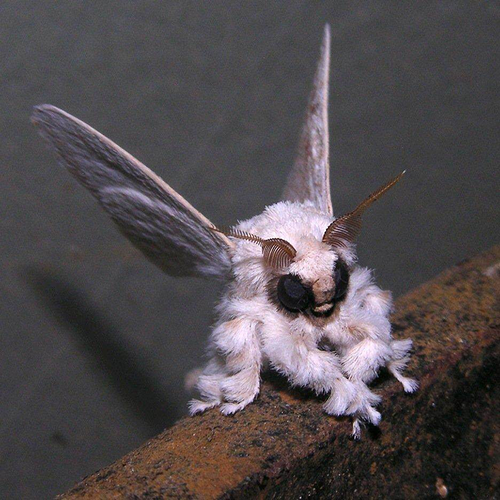 It's a male, based very strongly off of the Venezuelan poodle moth! do you have any ideas how I could improve the transition? Hard to say... maybe, show the window with the boy from a bit more far distance at the first one or two pictures of the second page? So more large fragments of sky and house outside would fit into them. It's a male, based very strongly off of the Venezuelan poodle moth! Wow. This real moth is very nice, too! Immediately struck with the colours -- wonderfully rich and vibrant, draws the eye in especially towards the source of warm light coming from the moon, owl's eyes, and window. The flow there is very well structured so as to keep the eyes moving in a consistent path down the page. The second page is full of lively character expressions which is tremendous for revealing the main character's personality right off. Love the establishing shot of him at his crafting table. There's some keen shots that focus on mood and intent, nicely paced. 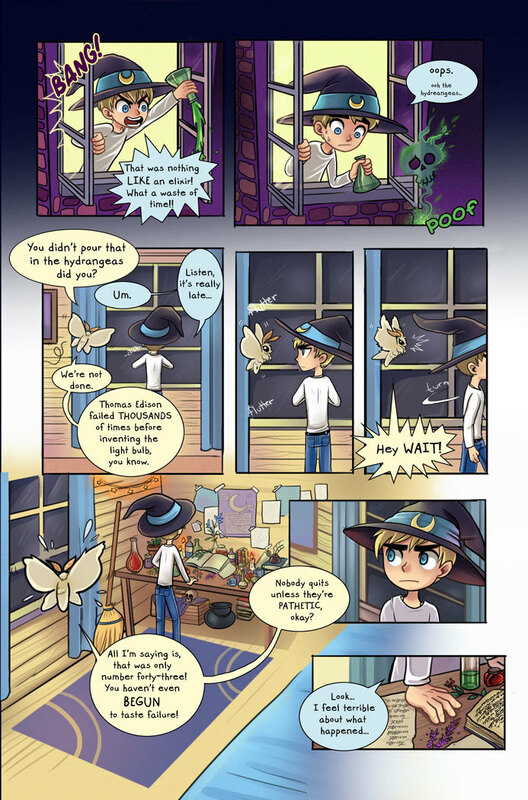 My only critique is for the second page -- the room's floor is just a little bare and I would love to see the gutters there filled with the walls/ceiling details in lieu of a soft gradient. It may juggle with the panels being too busy but those could be made thicker or with a textural contour to make them stand out more (maybe kind of rough and wispy looking to emphasis his magic experimentation!). Regardless, the art is fantastic and the pacing is spot on. This is a very strong first set of pages! 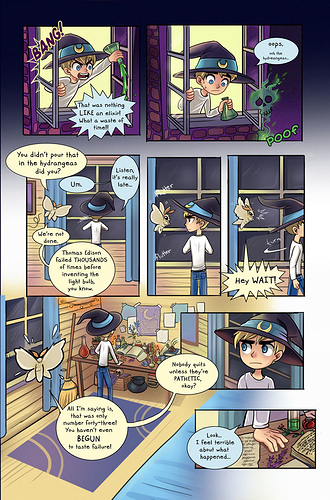 Boy's face expressions are great and the moth is really cute and I love how it has human expressions, but not humanized. The skull detail is on top for me =) Also, good to see traditional format! But people will bug you for the font size, oh they will, so it is better to make it bigger. Saying that because they stopped saying anything about my comic font just after I increased it two times and it looks twice bigger your font size. Not to mention "the hydrangeas", it is really hard to read on big screen, not to mention all these phone users. I am looking forward to subscribe to you, actually! Excellent font. But too small. Sense that you have been doing some real world building and I’m curious to see more. The carpet is confusing unless it has meaning to the story. I expect magic symbols in his room and the biggest symbol/patterns I see is on the carpet with no meaning? He's also provided a whole lot of free fonts for comic artists, and tons of tutorials. Really a great resource to putting that extra polish on the lettering! Thanks for the feedback! I did play around with putting things in the gutters, but it felt too busy to me. I will keep playing around with the floor of the room though- the room layout and decor are certainly up for modification! @Kelheor : Thank you so much!! I'm not sure when I'll get around to officially posting on a schedule but that means a lot to me! I started reading your comic and I love it!! @jensrichard77: Hm, I didn't really think about that with the carpet. I was just trying to keep with the color scheme and mood of the room! Thanks so much for your feedback! @JeanGuillet: Wow, thank you so much for the resources! That gives me a lot of solid direction to work with. This is the resource I didn't know I needed! 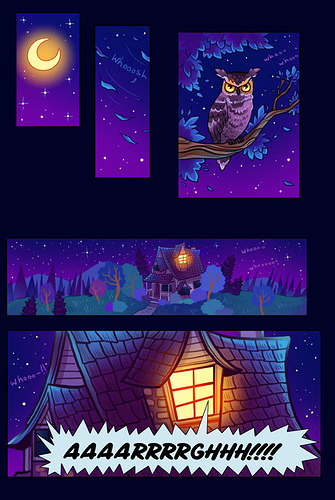 I like the contrast of the night, and the light glowing (in the owl's eyes and the windows), idk if that's called outter glow, i only know photoshop.